President Nana Addo Dankwa Akufo-Addo has urged private sector players to leverage on the novel Public Private Dialogue Platform (PPDP) to advance Ghana’s industrial transformation agenda. He charged the sector to use that channel- the PPDP – which government has introduced, to address quickly issues of mutual concern in other to create the desired wealth and prosperity for Ghanaians. The PPDL is a periodic forum where government and private sector representatives brainstorm to address the challenges facing key segments of the economy. President Akufo-Addo made the call at the maiden edition of the Chamber Business Awards, of the Ghana National Chamber of Commerce and Industry (GNCCI) at the Banquet Hall of the State House in Accra on Saturday. “Creating wealth and prosperity for the vast majority of our people is a shared responsibility,” he said. President Akufo-Addo said his government had made it a priority to create a favourable atmosphere for the success of the Private Sector, because that sector held the key to Ghana’s economic development and growth. “We have begun to work on the fundamentals of the economy, because we believe that an improved macro-economy is a fundamental requirement for stimulating the investments we need for the significant expansion and growth of the national economy, and the generation of wealth and jobs,” he said. Government, the President said, had over the last 10 months initiated measures to propel its industrial transformation agenda of which the private sector was a key partner. “Already, these deliberate interventions by government are showing positive signs, with a reduction in fiscal deficit from 9.5 per cent at the end of 2016, to 6.3 per cent this year. “Over that same period, Inflation declined from 15.4 per cent to 11.6 per cent. “Government is pursuing an aggressive industrial transformation agenda with strong emphasis on private sector participation in the overall growth and development of the Ghanaian economy,” the President noted. He said it was important that the structure of the Ghanaian economy was transformed from being dependent on the production and export of raw materials to an industrialised value added one. “Our generation has to accomplish this transition,” he said, with government’s set stimulus package intended to revitalise viable but financially distressed businesses under its Industrial Transformation Programme, with some 80 companies set to benefit from the incentive. Beside the stimulus package, 190 business proposals have also been selected for implementation under governments flagship One District, One Factory Initiative, to help provide the needed jobs and propel the country’s industrial transformation agenda. Furthermore, government, in collaboration with the Association of Ghana Industries, have arranged a suppliers credit facility for two billion dollars from China to provide equipment, machinery and other facilities in support of the programme. Additionally, the 2018 Budget has allocated funding, as Government’s contribution either as equity or in-kind support, for the establishment of district enterprises. The GCB Bank has pledged an amount of two billion Ghana Cedis towards the One-District One-Factory project. Furthermore an additional amount of 340 million dollars has been leveraged from local financial institutions for the programme. “This is the kind of leadership and collaboration that is required collectively to build Ghana Beyond Aid, and I encourage business people to take advantage of these opportunities that have been created by Government,” President Akufo-Addo said. The President assured the business community that his government was fully committed to transforming Ghana’s economy and leading the country into the new digital age. The Government, he said, had introduced the e-business registration, paperless port clearance, digital addressing, mobile interoperability, and the national identification systems to ease the cost of doing business in the country, and generate greater efficiency. President Akufo-Addo noted also that the success or otherwise of his administration would be judged largely on his government’s record of job creation. “It is for this reason that my government supports initiatives that will unleash the energies of business people, and stimulate the entrepreneurial potential of the Ghanaian. My view is clear. It is the private sector that can create the needed job opportunities for the people of our country, and I am confident that the Ghanaian private sector will rise to the challenge. “My government, on its part, will continue to build an enabling environment to provide the private sector with the needed catalyst to operate profitably, grow and remain internationally competitive,” he said. 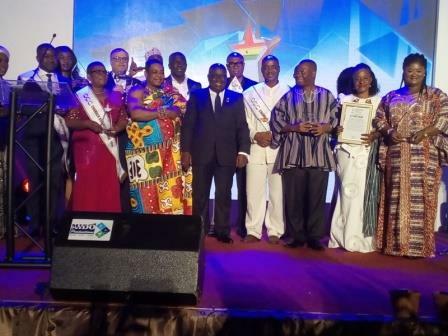 The President presented the award for the Chamber Businesswoman of the Year to Mrs Bella Ahu of Traffix Catering Services and that of the Chamber Businessman of the year to Issa Ouedraogo, a Certified Management Consultant (ICT), and Chief Executive Officer of B-BOVID Limited, a Ghanaian agro-business company.